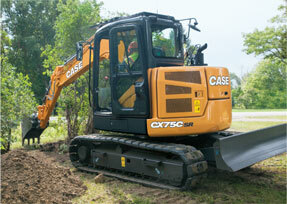 CASE excavators can deliver up to 17% more horsepower and save you an estimated $10,000 per year in fuel costs. Long reach and large excavators deliver the power and reach necessary for the toughest jobs, while the minimum swing radius excavators excel in the tightest work areas. No matter the size of the job or the type of site, CASE has the perfect excavator for your needs. CASE excavators utilize Cooled Exhaust Gas Recirculation (CEGR) technology to offer Tier 4 Final machines. Exhaust gases are cooled, blended with fresh air and then returned to the cylinder, lowering combustion temperatures and dramatically reducing NOx. Particulate matter is then reduced through the use of a Diesel Particulate Filter (DPF) system, resulting in improved fuel efficiency and reduced downtime.